The nine principles of war represent the most important nonphysical factors that affect the conduct of operations at the strategic, operational, and tactical levels. The Army published its original principles of war after World War I. 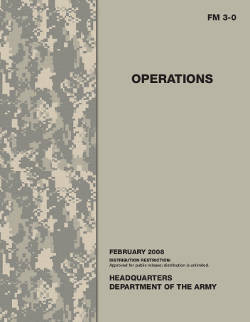 In the following years, the Army adjusted the original principles modestly as they stood the tests of analysis, experimentation, and practice. The principles of war are not a checklist. While they are considered in all operations, they do not apply in the same way to every situation. Rather, they summarize characteristics of successful operations. Their greatest value lies in the education of the military professional. Applied to the study of past campaigns, major operations, battles, and engagements, the principles of war are powerful analysis tools. Joint doctrine adds three principles of operations to the traditional nine principles of war. Direct every military operation toward a clearly defined, decisive, and attainable objective. A-1. The principle of objective drives all military activity. At the operational and tactical levels, objective ensures all actions contribute to the higher commander’s end state. When undertaking any mission, commanders should clearly understand the expected outcome and its impact. Combat power is limited; commanders never have enough to address every aspect of the situation. Objectives allow commanders to focus combat power on the most important tasks. Clearly stated objectives also promote individual initiative. These objectives clarify what subordinates need to accomplish by emphasizing the outcome rather than the method. Commanders should avoid actions that do not contribute directly to achieving the objectives. A-2. The purpose of military operations is to accomplish the military objectives that support achieving the conflict’s overall political goals. In offensive and defensive operations, this involves destroying the enemy and his will to fight. The objective of stability or civil support operations may be more difficult to define; nonetheless, it too must be clear from the beginning. Objectives must contribute to the operation’s purpose directly, quickly, and economically. Each tactical operation must contribute to achieving operational and strategic objectives. A-3. Military leaders cannot dissociate objective from the related joint principles of restraint and legitimacy, particularly in stability operations. The amount of force used to obtain the objective must be prudent and appropriate to strategic aims. Means used to accomplish the military objective must not undermine the local population’s willing acceptance of a lawfully constituted government. Without restraint or legitimacy, support for military action deteriorates, and the objective becomes unobtainable. Seize, retain, and exploit the initiative. A-4. As a principle of war, offensive is synonymous with initiative. The surest way to achieve decisive results is to seize, retain, and exploit the initiative. Seizing the initiative dictates the nature, scope, and tempo of an operation. Seizing the initiative compels an enemy to react. Commanders use initiative to impose their will on an enemy or adversary or to control a situation. Seizing, retaining, and exploiting the initiative are all essential to maintain the freedom of action necessary to achieve success and exploit vulnerabilities. It helps commanders respond effectively to rapidly changing situations and unexpected developments. A-5. In combat operations, offensive action is the most effective and decisive way to achieve a clearly defined objective. Offensive operations are the means by which a military force seizes and holds the initiative while maintaining freedom of action and achieving decisive results. The importance of offensive action is fundamentally true across all levels of war. Defensive operations shape for offensive operations by economizing forces and creating conditions suitable for counterattacks. A-6. Commanders mass the effects of combat power in time and space to achieve both destructive and constructive results. Massing in time applies the elements of combat power against multiple decisive points simultaneously. Massing in space concentrates the effects of combat power against a single decisive point. Both can overwhelm opponents or dominate a situation. Commanders select the method that best fits the circumstances. Massed effects overwhelm the entire enemy or adversary force before it can react effectively. A-7. Army forces can mass lethal and nonlethal effects quickly and across large distances. This does not imply that they accomplish their missions with massed fires alone. Swift and fluid maneuver based on situational understanding complements fires. Often, this combination in a single operation accomplishes what formerly took an entire campaign. A-8. In combat, commanders mass the effects of combat power against a combination of elements critical to the enemy force to shatter its coherence. Some effects may be concentrated and vulnerable to operations that mass in both time and space. Other effects may be spread throughout depth of the operational area, vulnerable only to massing effects in time. A-9. Mass applies equally in operations characterized by civil support or stability. Massing in a stability or civil support operation includes providing the proper forces at the right time and place to alleviate suffering and provide security. Commanders determine priorities among the elements of full spectrum operations and allocate the majority of their available forces to the most important tasks. They focus combat power to produce significant results quickly in specific areas, sequentially if necessary, rather than dispersing capabilities across wide areas and accomplishing less. Place the enemy in a disadvantageous position through the flexible application of combat power. A-11. Maneuver concentrates and disperses combat power to keep the enemy at a disadvantage. It achieves results that would otherwise be more costly. Effective maneuver keeps enemy forces off balance by making them confront new problems and new dangers faster than they can counter them. Army forces gain and preserve freedom of action, reduce vulnerability, and exploit success through maneuver. Maneuver is more than just fire and movement. It includes the dynamic, flexible application of all the elements of combat power. It requires flexibility in thought, plans, and operations. In operations dominated by stability or civil support, commanders use maneuver to interpose Army forces between the population and threats to security and to concentrate capabilities through movement. For every objective, ensure unity of effort under one responsible commander. A-12. Applying a force’s full combat power requires unity of command. Unity of command means that a single commander directs and coordinates the actions of all forces toward a common objective. Cooperation may produce coordination, but giving a single commander the required authority is the most effective way to achieve unity of effort. A-13. The joint, interagency, intergovernmental, and multinational nature of unified action creates situations where the commander does not directly control all organizations in the operational area. In the absence of command authority, commanders cooperate, negotiate, and build consensus to achieve unity of effort. Never permit the enemy to acquire an unexpected advantage. A-14. Security protects and preserves combat power. Security results from measures a command takes to protect itself from surprise, interference, sabotage, annoyance, and threat surveillance and reconnaissance. Military deception greatly enhances security. Strike the enemy at a time or place or in a manner for which he is unprepared. A-15. Surprise is the reciprocal of security. It is a major contributor to achieving shock. It results from taking actions for which the enemy is unprepared. Surprise is a powerful but temporary combat multiplier. It is not essential to take enemy forces completely unaware; it is only necessary that they become aware too late to react effectively. Factors contributing to surprise include speed, operations security, and asymmetric capabilities. Prepare clear, uncomplicated plans and clear, concise orders to ensure thorough understanding. A-16. Plans and orders should be simple and direct. Simple plans and clear, concise orders reduce misunderstanding and confusion. The situation determines the degree of simplicity required. Simple plans executed on time are better than detailed plans executed late. Commanders at all levels weigh potential benefits of a complex concept of operations against the risk that subordinates will fail to understand or follow it. Orders use clearly defined terms and graphics. Doing this conveys specific instructions to subordinates with reduced chances for misinterpretation and confusion. A-17. Multinational operations put a premium on simplicity. Differences in language, doctrine, and culture complicate them. Simple plans and orders minimize the confusion inherent in this complex environment. The same applies to operations involving interagency and nongovernmental organizations. a. Planning. Careful and detailed planning is a prerequisite for guerrilla combat operations. Plans provide for the attack of selected targets and subsequent operations designed to exploit the advantage gained. Additionally, alternate targets are designated to allow subordinate units a degree of flexibility in taking advantage of sudden changes in the tactical situation. Once committed to an operation the area command has little capability to rapidly manipulate subordinate units to other missions. This lack of immediate response is due to the shortage or non-existence of radio communications equipment within smaller guerrilla units coupled with relatively large zones of action. Thus, plans must be thorough and flexible enough to allow commanders who are responsible for an operation or series of operations to adopt alternate predetermined courses of action when contingencies arise. b. Intelligence. The basis of planning is accurate and up-to-date intelligence. Prior to initiating combat operations, a detailed intelligence collection effort is made in the projected objective area. This effort supplements the regular flow of intelligence. Provisions are made for keeping the target or objective area under surveillance up to the time of attack. c. Decentralized Execution. Guerrilla combat operations feature centralized planning and decentralized execution. Action of all resistance elements is directed and coordinated by the area commander, subordinate units are allowed the widest possible latitude in the conduct of operations. d. Surprise. Guerrilla combat operations stress surprise. Attacks are executed at unexpected times and places. Set patterns of action are avoided. Maximum advantage is gained by attacking enemy weaknesses. Low visibility and adverse weather are exploited by guerrilla forces. Surprise may also be enhanced by the conduct of concurrent diversionary activities. e. Short Duration Action. 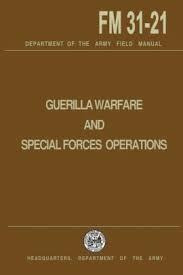 Usually, combat operations of guerrilla forces are marked by action of short duration against the target followed by a rapid withdrawal of the attacking force. Prolonged combat action from fixed positions is avoided. f. Multiple Attacks. Another characteristic of guerrilla combat operations is the employment of multiple attacks over a wide area by small units tailored to the individual mission. This is not piecemeal commitment of units against single targets but a number of attacks directed against several targets or portions of the target system. Such action tends to deceive the enemy as to the actual location of guerrilla bases, causes him to over-estimate guerrilla strength and forces him to disperse his rear area security and counter guerrilla efforts.